A flotilla of traditional Thames craft led by the Queen's row barge Gloriana has been axed from this year's Lord Mayor's Show. 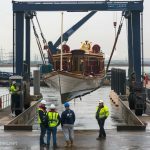 QRB Gloriana and the Traditional Thames Rowing Association (TTRA) have been told they will not feature in the pageant which takes places in November. 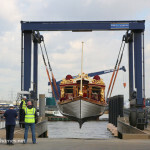 The ancient tradition of carrying the new Lord Mayor of London down the river was revived following the building of Gloriana for the Queen's Diamond Jubilee in 2012. 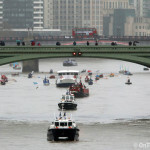 Since then, over twenty of the traditional Thames cutters have accompanied the new Lord Mayor in a colourful spectacle on the river on the morning of each of the yearly Lord Mayor's Shows. 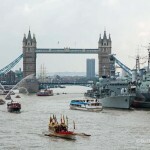 Rower Joe Lane shared the news on Twitter: "Such a shame that they have decided to cancel Gloriana and the @citylordmayor thames flotilla. Another piece of London’s Livery showpiece sunk." "It's too early in the day"
Asked if he had been told why the decision had been made, he replied: "It’s too early in the day. 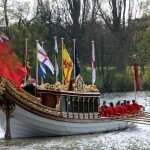 Strange when all aboard Gloriana and accompanying flotilla have never complained. Always good to see London’s Livery Companies afloat on the Thames." The annual flotilla starts from Westminster Boating Base at Pimlico at 0830 and ends at HMS President an hour later. "Having organised The Lord Mayor’s Flotilla for the past seven years following the initial request by Alderman Wootton who asked “I’d like to arrive in the City by boat, can you arrange it for me?” it was with great disappointment that I received the call from the Pageant Master informing me that we would not be required in the future. It has been a great honour and pleasure to carry the Lord Mayor and their party to the City of London on the morning of the Lord Mayor’s Show which links it back to the origins of the show when it was all afloat on the River Thames. November is maybe not the best time to be out on the river but with over twenty boats being entered each year there has always been wonderful support from within the Livery Companies and City Organisation who either own or charter boats to take part and in any case the date can’t be changed! 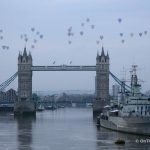 May I thank all those who supported the event and I look forward to seeing you out on the River Thames in London again very soon." Tweeting from his personal account, Pageant Master of the Lord Mayor's Show Dominic Reid replied: "Looking forward to working with @TTRALondon and @GlorianaQRB to create an even better event at a sunnier time of year." 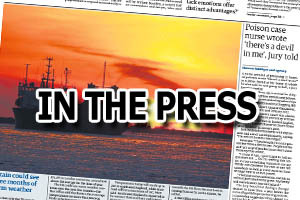 The City of London Corporation has been approached for a comment.